This past Tuesday, the second meeting of the Route 29 South Corridor Advisory Committee was held at the Silver Spring Civic Center. 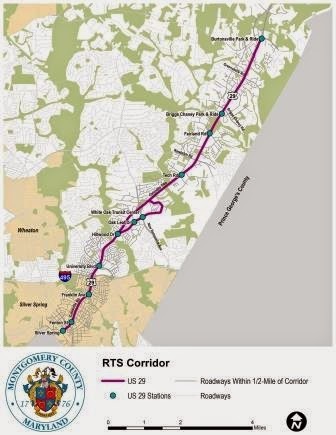 The Corridor Advisory Committee (CAC) was formed in February to allow citizens to have input on the planning process of the Route 29 BRT line, a part of the county's broader Rapid Transit System (RTS). The meeting agenda involved an explanation of the Project Development Process, an Existing Conditions Review, an intro to the Corridor Planning Study, and concluded with an Interactive Exercise. However, the meeting only roughly followed this schedule and it did not go into much detail, as the facilitators could not effectively progress through the agenda due to frequent questions from the committee members. While some of these questions were constructive and advanced the positive dialogue, many were simply obstructionist statements meant to hinder the committee process. I understand that bus rapid transit is a controversial issue, but the tone with which some of my fellow committee members addressed the facilitators (and others on the committee) was unnecessarily rude. It was odd to me, as the youngest person in the room, to see people of my parents' generation act as if they are back in grade school by making snide and demeaning remarks, and frequently interrupting the facilitators and other committee members. I'm sure those who were being rude and disrespectful would claim that they are just being assertive, and that their extreme skepticism and purposeful diversion of the agenda was warranted due to past actions on the county's part. However, at a certain point, this healthy skepticism and sincere quest for answers becomes overt obstructionism, meant only to derail the public process instead of enhance it. There was far too much obstructionism at the meeting Tuesday night. That being said, the county and AECOM (contracted by the county to facilitate these sessions) did themselves no favors by setting a rigid agenda, spending more than an hour "presenting" information that was repeated from past meetings, and selecting members of the committee that are not representative of the community. There were very few minorities, renters, or people under age of ~40 selected to participate (there are only two people on the committee in their 20s, one of which is me). The demographics of the committee do not closely align with the demographics of Silver Spring, Four Corners, and White Oak. The US 29 RTS Corridor. Image from MCDOT.